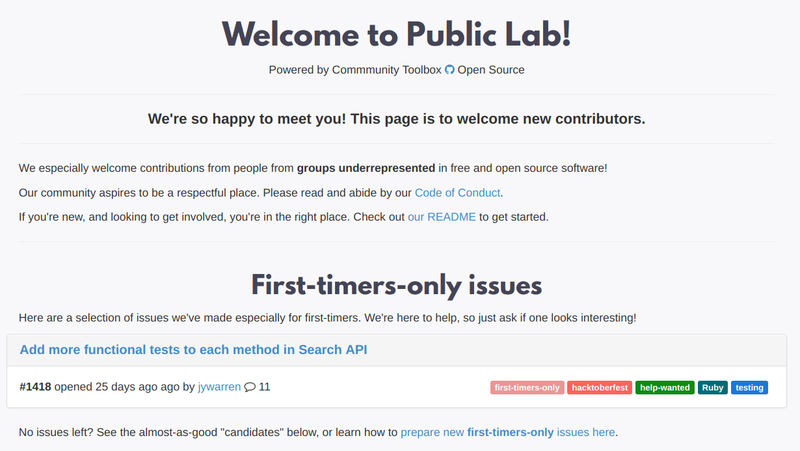 Since early 2016, Public Lab has worked to make our open source software projects more welcoming and inclusive & to grow our software contributor community in diversity and size. This page collects some of those strategies and initiatives. We hope these will be useful for other free and open source projects as well. Please ask a question if you'd like to know more, and contact jeff@publiclab.org if you'd like to contribute a post. Thanks! Good outreach will make you a better coder! Since 2016, we have learned from and incorporated strategies from other communties like the Hoodie project, SpinachCon, FirstTimersOnly.com, UpForGrabs.net, and Outreachy, and also shared our own ideas, and this session will cover a range of principles and strategies that have emerged across a number of separate efforts in different open source projects. An even more important counterpart to friendliness is to ensure people feel safe by clearly forbidding inappropriate behavior in a Code of Conduct, and by making sure people know the Code of Conduct and follow it. As highlighted by the Hoodie community and the First-timers only movement, one of the first steps to having a more welcoming and inclusive community is to be really nice. This can come through in documentation, in discussions, by providing positive and constructive support, and when thanking people for their work. Modeling and talking about welcoming and friendly tone is important to establishing and sustaining a welcoming culture for newcomers and long-time contributors alike. As pioneered by the site http://firsttimersonly.com and championed by Hoodie, we provide newcomers a chance to learn how we collaborate by going through a step-by-step guided issue to make their first contribution. These issues take longer to make than fixing the actual bug, but the purpose is to engage with a new community member and show them how to work with us in an encouraging and supported way. They are also small enough issues that they can be done in a fairly short period of time, and this encourages modularity (see below) -- complex, layered processes must be broken into smaller, simpler modules in a sequence, or there's "no way for others to enter the work"! One key strategy adapted from Rasmus Praestholm of the Terasology project is to have a page specifically for welcoming and supporting newcomers, as shown in the screenshot above (Rasmus developed several Trello pages to help organize the welcoming process). This page is friendly, provides newcomer-specific resources and also features a call to action with #first-timers-only issues (see above). I encourage ANYONE doing open source work to think hard about how their project can be better modularized -- along with the various other strategies on this page, it can lead to a major influx of new contributors! How can we understand what's working and not working in our efforts to welcome a broader and more diverse group of contributors into our community? Evaluation techniques are critical to understanding what we're doing poorly and what's working. Once you've gotten a lot of people to take their first step in contributing, what's next? We ask new contributors, once they've taken the initial step, to create their own first-timers-only issues. After all, they're now experts in being first-timers! Community Toolbox asks people to take the next step by writing their own. Social media outreach can be a surprisingly powerful way to recruit people, by making them feel truly welcome, encouraged, and -- once they've made a contribution -- thanked! We're learning to do this better, but thanks to efforts like FirstTimersOnly.com for helping to get out the word on social media. But there are things to look out for -- like ensuring automated messages are themselves friendly and encouraging, not harsh and intimidating. Language matters! But the key here is that people can share what they've got done so far, and ask for help early. We encourage folks to open a PR as early as possible so other community members can "look over their shoulder" and offer support. Some issues can be solved without even installing a project locally (scary!). We participate in several and there are lots out there! We use Welcomebot and First-Timers-Bot to great effect at Public Lab code projects, and you're free to copy our templates from here. Each plays a number of roles. Each is an opportunity to a) be friendly and encouraging, b) offer resources and support, c) guide people through the process in a "trickle onboarding" way, so that they didn't have to face all the information up front, but could get it just when they need it, gradually.